Interlingue makes your WEB site Internationalize in 3 steps, very easy. You can order crowd-sourced translation from the Interlingue management console. Translators from around the world are translate your website. You may rest assured since you can sort out translation jobs and get quotes before you order a translation. After the translation is complete, the only thing left to do is publish the website. You can publish a truly globalized website that is compatible with a variety of languages very easily. Interlingue's automated translation is linked in with translation service of Gengo®. 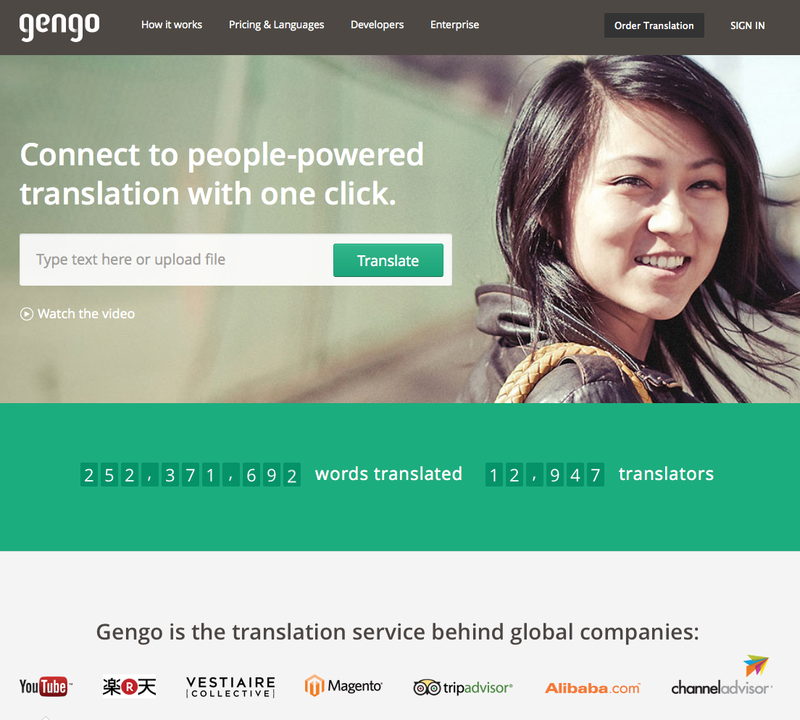 Gengo® is a people-powered translation platform that connects over 13,000 translators with translation needs from around the world through the cloud. From Japanese: Chinese (Simplified), Chinese (Traditional), English, Indonesian, Korean, Spanish (Spain), Thai. 2-step translation is also available (example: Japanese → English → Danish). For more information please see WEB site of Gengo®. allowing you to automatically make your monolingual website into multilingual one. but also numerous features that exceed those of other CMS solutions. Designers are able to design using the same methods when creating static websites. Additionally, Interlingue provides an easy to learn template system. This template system can be operated so seamlessly that you might even forget you are designing for a CMS. You can define content models within the website without any sort of coding whatsoever. On the other hand, when defining complex models for blog-based CMS solutions such as those for Wordpress, it is necessary to expand the system. Updating content can be done in-line (without the need to access the management console). Additionally, the highly refined interface of the management console makes it very easy to get the hang of. Since site content and design are "completely" isolated from each other, renewing designs, and server migration and expansion can be done without disrupting your website. Rather than pushing them to the actual website, you can push your designs to the CMS after checking design changes from your local environment. Special plug-ins and additional development are not required to make your website multilingual. The management console has been translated into over 15 languages, so you can immediately construct a website where you can smoothly switch between multiple languages. Interlingue is built-on the Ruby on Rails framework developed by accomplished developers from around the world and utilizing various open-source products that withstand several tests and real-world usage. Now, We are released "closed" version. Companies and WEB Site Administrators that wish to try this product earlier than general customers, please submit your inquiry using the form below.